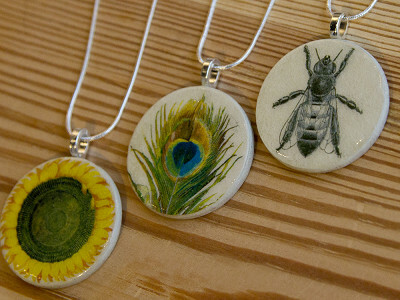 Retropage Handmade makes unique decoupage pendants that turn any necklace into a conversation piece. The artist behind Retropage, Anna Cinquemani, developed an appreciation for out of print pictures when her mother is a rare book dealer. A graphic designer with a fine arts education, Anna hand cuts pictures from books that are no longer published, as well as old postcards and other public domain collections. Then, using the time honored technique of decoupage, she layers multiple coats of varnish, gently sands and glazes them for a vintage, painted look. The 1 ½” pendants look substantial, but in fact, are very lightweight. They hang beautifully on a 16” silver plated chain. Hi everyone! I am Anna Cinquemani, designer of retropage pendants. 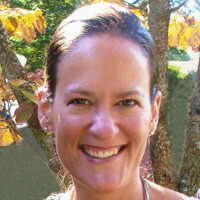 I am so excited about being featured on the Grommet! Every pendant is packaged in a neat crystal clear bag, complete with a silver chain, ready for gift giving. In order to take care of your decoupaged pendant, please clean periodically with soft cloth. Although the pendants are water resistant, they are not waterproof, so remember no wearing in the shower or the pool! I hope you love wearing these pendants as much as I love making them. Please do not hesitate to ask me any questions here. Add a little vintage flair to your next outfit! I work at a non-profit sanctuary for orangutans and chimpanzees. If you have any pendants with either of those animals on them I'd be very interested. Thanks! Thanks, Susan. These are great suggestions and I'm sure Anna will keep in mind for the future. Hi, Susan! That's wonderful! At the moment, we are offering these selections on the Grommet. Please look for possible new designs in the future! Anna ... I would like to know if you could create a retropage pendant from a photo, lets say a family pet? Thanks, Chip. Right now, the options listed are what's available on The Grommet, yet this is a great idea for Anna. I'm sure she'll take it into consideration for the future. Hi, Chip, I don't offer this presently, but it's a great idea! Thanks for writing! Beautiful work. Using an old technique in a new, imaginative way is true crafting. Thank you for the visual images. 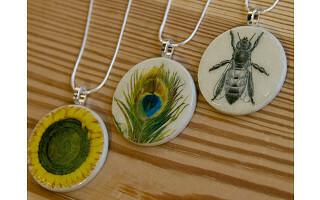 Retropage Handmade makes unique decoupage pendants that turn any necklace into a conversation piece. The artist behind Retropage, Anna Cinquemani, developed an appreciation for out of print pictures when her mother is a rare book dealer. A graphic designer with a fine arts education, Anna hand cuts pictures from books that are no longer published, as well as old postcards and other public domain collections. Then, using the time honored technique of decoupage, she layers multiple coats of varnish, gently sands and glazes them for a vintage, painted look.